COUNTRY KITCHEN - 9 in. Berry Bowl. 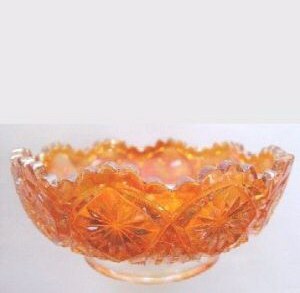 COUNTRY KITCHEN: is a pattern which was produced in many shapes during the crystal glass period. 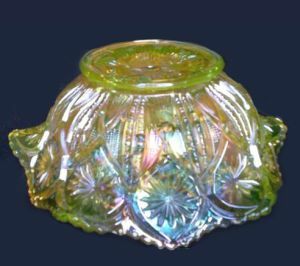 Few examples are found in carnival glass, however. 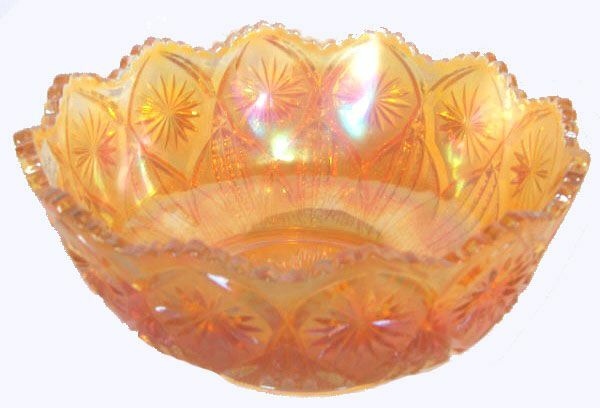 5” and 9” berry bowl sets found only in marigold, along with a table set, spittoon whimsey and a few swung vases shaped from the spooner mould are the extent of shapes to be found. All are quite scarce. Country Kitchen is found as an exterior pattern used in company with other interior designs, as well. FLEUR DE LIS Bowl in Vaseline. Only one known.-Country Kitchen Exterior. 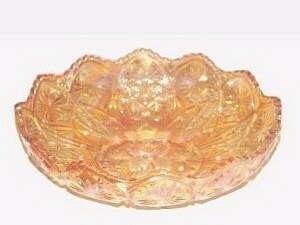 FLEUR-DE-LIS Dome Footed Bowl - IC shape in Amehtyst- 9 in. diam. 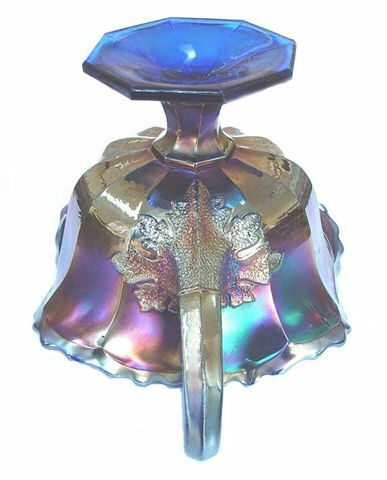 FLEUR-DE-LIS IC Shape Collar Base -9.25 in. diam. FLEUR_DE_LIS: This is a favorite pattern with collectors, possibly by reason of the various shapes to be accumulated. 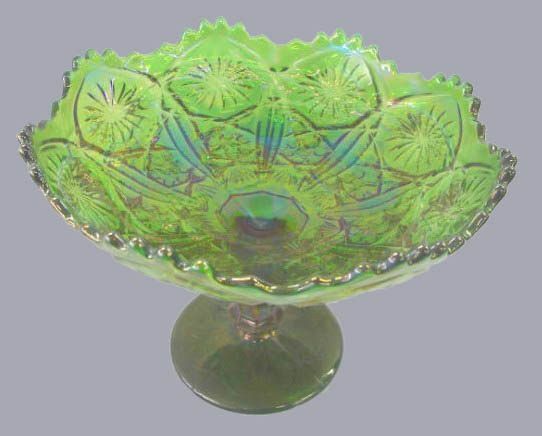 Along with the six variations displayed here, one compote in green is known, as well as a couple of rose bowls. 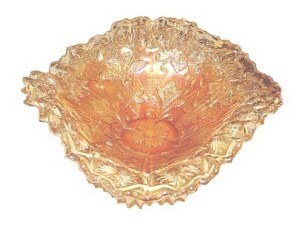 Fleur De Lis is also an interior pattern on some Hobstar and Feather punch bowls. It is difficult to find a footed piece without some damage to the points around the base. 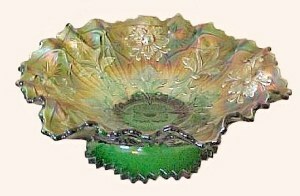 POPPY Salver with POTPOURRI Exterior Design. 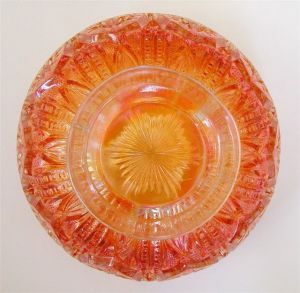 POPPY: Most often seen is the 6” tall x 7” d. deep bowl with slightly turned out edge. The base of the stem displays a small design of Potpourri pattern. 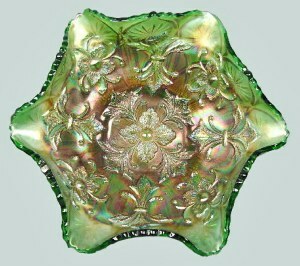 All of these compotes offer good color and the radium finish. 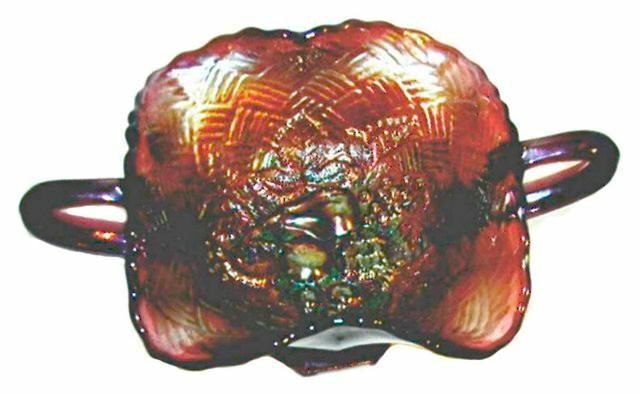 The compote shape having a flattened top (salver) is very rare. It stands 6” tall and the bowl is flattened to about 8” in d. with the edges of the bowl straight up. Poppy design is only found as the interior of these two compotes. Marigold is more difficult to locate than amethyst or green. 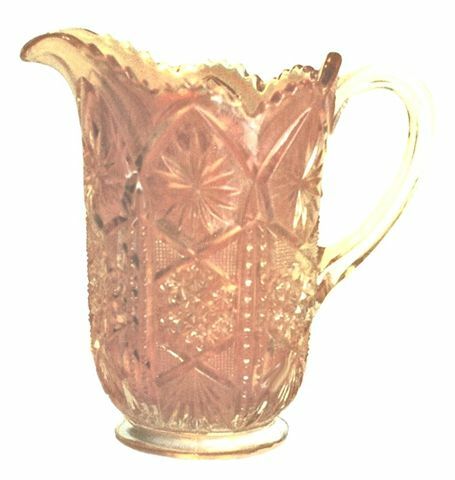 POTPOURRI Milk Pitcher: Only a couple of these pitchers are known and both are marigold. The cut design combined with great color offer a desirable rarity of quality. Seldom offered for sale at auction, one brought $1600. in 1990 and another sold in 1993 for $2,450. One sold in 2003 for $1300. 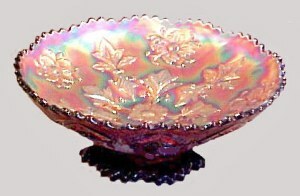 FRUIT BASKET: The two-handled footed bon-bon is the only article in this pattern and it comes in amethyst. The basketweave background design is overlapped with pineapple, grapes, pear, apple and cherries, nicely grouped in the center along with stippled leaves. Roses and Fruit bon-bons carry the same exterior pattern. Since only four or five examples are known and rarely offered for sale, to successfully own one requires determination to pay whatever the market requires. Stippled LEAF design. Exterior of Fruit Basket and Roses & Fruit bon-bons. EXT. Leaf design: The base mould for these two bon-bons is the same. Please bear in mind that the design is repeated around each of the handles. We show only one side, so that you can fully appreciate the stippling and the notched effect seen on the stem. Only the interior “plunger” was exchanged. The inspired writer of Psalm 139 glories in the biblical doctrine that God knows everything and is everywhere!